Introducing The Cheshire Dining Experience — The Canvas Tent Co.
Award winning, Michelin AND silver service trained, husband and wife team Tor and Andi Lowe-Smith founded The Cheshire Dining Experience alongside best pal Steve O’Hagan. These guys are driven by their passion for food; punchy and full of zest – just like their dishes, spend just 5 minutes in their company and you too will come away wanting a taste of whatever it is their dishing out! True to their name, they pride themselves on their luxury, innovative, sociable dining experience - a sensual thrill for all involved. Their beautifully formed dishes are a visual delight; hearty with delicate trimmings, at times quite sculptural and always vibrant in colour with layers of contrasting textures - their servings really are a work of art! 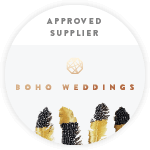 Offering a bespoke service, TCDE work closely alongside their couples to create a completely personalised menu to ensure the food reflects their personalities and their wedding themes. From a delicious serving of street food nibbles at an informal outdoor garden reception to a beautifully designed sit down evening meal with a more traditional feel - The Cheshire Dining Experience want nothing more than to work alongside you to create your ultimate foodie wedding goals! Of course, they cater for any dietry requirements and with Tor being vegan herself, TCDE produce the most sensational ethical, plant-based creations! Their passion is authentic, their service impeccable. The team use their catering expertise to create a truly unique dining experience, completely personal to you. You can chat to the team and get a taste of The Cheshire Dining Experience at A Spring Pop-Up Wedding Fayre on the 12th May 2019! If you like what you see and would like to find out more, you can visit their website here.